MARK BRIGGS ATTORNEY SHARES TIPS FOR DEVELOPING A GREAT BUSINESS STRATEGY. 1) What do you want? : This one seems obvious enough, but that’s only because it is inherently crucial to developing a good business strategy. What are your ultimate business goals? Who do you want to reach? What is your mission statement? All of these very basic questions will directly feed into the rest of your business strategy. 2) Be prepared: To accomplish your goals, you will almost certainly need access to certain valuable resources—be they employees, software, equipment, financing, or something else entirely. Make sure you know what you need, then figure out what it will take to acquire it. 3) Focus on you: Unless you are the initiator of a new industry (and sometimes, even then) you are going to have competition. As you’re developing your strategy, it can be pretty tempting to stare at the other guys, and try to figure out what they’re doing, but you must remember to stay focused on what makes your business unique and great. Otherwise, you run the risk of becoming “just another company,” and will never be able to achieve your full potential as an innovator. 4) Know your industry: Of course, even as you “focus on you,” the goal should still be to be the best in your field. Put in some time to determine what it will take to put you on top, and to best the offerings of your competition. 5) Think big: Don’t sell yourself short. Give yourself permission to dream big. It’s not going to hurt to let your aspirations go crazy—as the old saying goes, “Shoot for the moon, because even if you miss you’ll hit the stars.” Who cares if you never become Google or Coca Cola? As long as you have big goals, you are bound to spend every day working to make your company better. 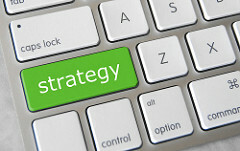 What are your thoughts on what it takes to build a good business strategy? Please share them in the comment section!